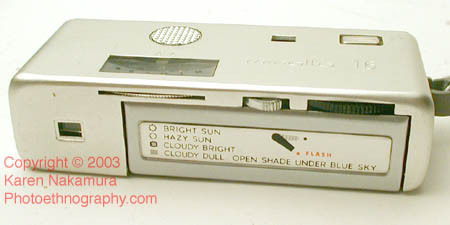 The Minolta 16 P is a subminiature camera made by Minolta during the 1960s. The interesting thing is that although it looks like a Type 110/Instamatic camera, it actually takes a 16mm cartridge. The negative size is 10mm x 14mm which is about 25% the area/size of 35mm film. The best web page I've found has been on Submin.com, but although they show 3 different varieties that vary based on their ASA ranges (ASA 10-200; 10-160; and 10-160), mine is a unique 4th variety. My unit's ASA ranges from 12-200 and there is a flash on/off switch on the front that seems to control the shutter speed. The regular speed (flash off) is 1/100 sec. while turning the flash on speed appears to set the shutter to around 1/30 sec. I'm eyeballing this so I'm not sure. A little bit more research on this web site and I discover that my unit is actually the Minolta 16 Ps and that the second shutter speed is indeed 1/30 sec. for better synchronization with flash units. Boy, I'm smart, aren't I? would have found every manual Minolta made for their 16mm range. the thumbnail image to see the full size. Oops... my bad, I guess I'm not so smart as I thought I was... :-) In any case, if you're curious, give Gerald's site a gander. It's a great resource for all subminiature cameras. The submini's are truly tiny but since they use non-standard film sizes (ok, ok, you can cut it yourself from 35mm film but...), they're a bit of a pain to use. If you're into miniature 35mm cameras, also check out the Minox 35GL and the Olympus XA, two of the smallest production 35mm cameras. Copyright © 2005 Karen Nakamura / Photoethnography.com. Use of this chart, text, or any photographs in an eBay auction without permission will result in an immediate IP violation claim with eBay VeRO. Violators may have their eBay account cancelled. Minolta began making cameras in 1928 as the "Nichi-doku Shashinki Shokai" (Japanese-German Camera Factory) and in 1937 was renamed Chiyoda Kogaku Seiko Kabushiki Kaisha or Chiyoko for short. One man was the heart of the company, Kazuo Tashima. He ran the company from 1928 to 1972. Before the war, Chiyoko made medium and large format cameras and began making 35mm cameras after the war. They started using the Minolta brand in 1937. In the post-War period, they made a series of Leica clones, the Minolta 35 rangefinder. 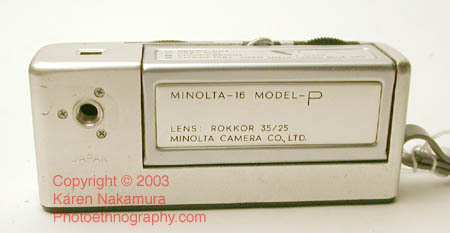 In 1962, Chiyoko changed its name to Minolta. They are famous for the first SLR with fully coupled metering, the SR-7 and the first model with built-in motor drive (SR-M). They also produced the first camera with integral autofocus, the Minolta Maxxum 7000 (aka Alpha 7000) in 1985. I remember when in 1986, my dad brought home his shiny new Minolta 7000 and handed me down his old Pentax Spotmatic SPII (which still have). Ironically, the Pentax still sees more use than the Alpha because of its ability to run fully manually. In any case, Minolta continues to make great 35mm SLRs as well as an increasing array of interesting digital cameras. 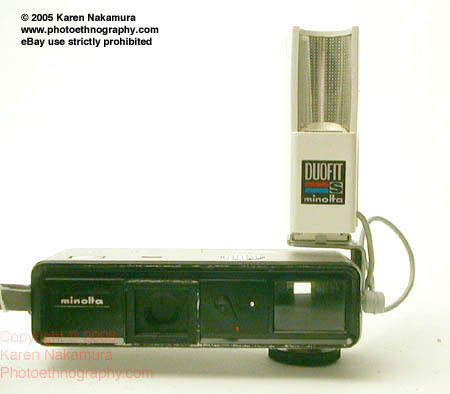 In 2003, Minolta announced a merger with Konica, Japan's oldest camera manufacturer. Hopefully the merged company (Konolta? Monica?) will have enough financial resources to continue to produce high-end film-based SLRs and rangefinders. Where can I get Minolta 16 film? Last modified: Thursday, 11-Mar-2010 00:55:27 EST , [an error occurred while processing this directive] .